Hawksbills are named for their narrow, pointed beak. They also have a distinctive pattern of overlapping scales on their shells that form a serrated-look on the edges. These colored and patterned shells make them highly-valuable and commonly sold as “tortoiseshell” in markets. Hawksbills are found predominantly on coral reefs. They feed mainly on sponges by using their narrow pointed beaks to extract them from crevices on the reef, but also eat sea anemones and jellyfish. Their head is elongated and tapers to a point, with a beak-like mouth that gives the species its common name. The shape of the mouth allows the hawksbill turtle to reach into holes and crevices of coral reefs to find food. The plates on the shell (scutes) are imbricated (overlap one another at their trailing edge, much like shingles on a roof), and form sharp points at the rear edge of the shell. Top shell (carapace) is dark to golden brown with varied patterns of brown, gold, and black streaks and blotches, while the bottom shell (plastron) is yellow; head yellow-white with black spots; flippers mostly etched black on top, light underneath; hatchlings are mostly brown. Typically 25-35 inches (65-90 cm) in length. Hatchling weigh about 0.5 ounces (15 g), adults may weigh between 100-150 pounds (45-70 kg). The hawksbill’s narrow head and jaws shaped like a beak allow it to get food from crevices in coral reefs. They are known to consume various small invertebrates and in some locations algae, but sea sponges comprise the majority of their diet throughout their range. In fact, hawksbills are one of only tewo species that can eat sponges (the other species is the angel fish). Male hawksbills mature when they are about 27 inches (70 cm) long. Females mature at about 30 inches (80 cm). The ages at which turtles reach these lengths are unknown. Female hawksbills return to the beaches where they were born (natal beaches) every 2-3 years to nest. They usually nest high up on the beach under or in the beach/dune vegetation. Madagascar, Seychelles, Iran, Oman, Maldives, Yemen, Chagos Islands (British Indian Ocean Territory), and Sudan. In the Pacific Ocean, the major rookeries occur in Queensland, Australia, northeastern Arnhem Land (Northern Territory, Australia), Indonesia, Papua New Guinea, Philippines, Vanuatu, and Solomon Islands. Hawksbill turtles are circumtropical, usually occurring from 30° N to 30° S latitude in the Atlantic, Pacific, and Indian Oceans and associated bodies of water. Hawksbills are widely distributed throughout the Caribbean Sea and western Atlantic Ocean, regularly occurring in southern Florida and the Gulf of Mexico, in the Greater and Lesser Antilles, and along the Central American mainland south to Brazil. After initially developing among sargassum habitats at the surface of the open ocean, hawksbill turtles are most commonly associated with healthy coral reefs. The ledges and caves of coral reefs provide shelter for resting hawksbills both during the day and at night. Hawksbills are known to inhabit the same resting spot night after night. Hawksbills are also found around rocky outcrops and high energy shoals, which are also optimum sites for sponge growth. They are also known to inhabit mangrove-fringed bays and estuaries, particularly along the eastern shore of continents where coral reefs are absent. In Florida, juvenile hawksbills are observed on the reefs off Martin, Palm Beach, Broward, Miami-Dade, and Monroe Counties. Most of these small turtles are believed to originate from nesting beaches in Mexico. to open-beach nest placement), and deposit more eggs per nest (on average) than any other reptile (around 140). The hatchlings are more narrowly-shaped than those of other hard-shelled sea turtles, potentially enhancing escape through tangles of roots. Hatchlings appear to utilize epi-pelagic habitats before returning to coastal waters as juveniles, where considerable mixing of regional stocks may occur. Like other hard-shelled sea turtles, hawksbill turtles are expected to reach maturity between 15 and 30 years of age, at which time they typically return to the region where they originally hatched for reproduction. It is not known how long hawksbills typically live in the wild, but it is expected that they can reach at least 50 years of age. Commercial exploitation remains the primary cause of the decline of hawksbill sea turtles. Historically, the hawks- bill’s scutes (mistakenly referred to as “tortoiseshell”) have been crafted for countless personal effects (combs, hair clips, bracelets, jewelry), as well as inlays and accents for fine furniture and woodwork. Stuffed juvenile hawksbills are sold as souvenirs throughout the tropics, particularly southeast Asia. Though the international demand for hawksbill products has declined, local consumption of shell, meat, and eggs still occurs globally. Additionally, habitat degradation continues to affect both coral reefs and nesting beaches, which further challenges the future of these populations. In response to the dramatic decline of hawksbill populations, they were listed under the Endangered Species Conservation Act (the precursor to the current ESA) in 1970. 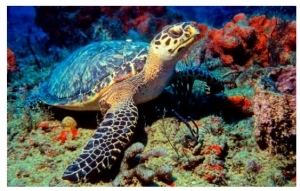 • Home Range and Movement Patterns of Subadult Hawksbill Sea Turtles in Southeast Florida. Wood, LD, Brunnick, B, and Milton, S. 2017. Journal of Herpetology, Vol. 51, No. 1, 58–67. • The IUCN Amphibia-Reptilia Red Data Book. 1982. • Sea Turtles: A Complete Guide to Their Biology, Behavior and Conservation. James R. Spotila. 2004. ACKNOWLEDGMENTS: The information contained in this document was gathered from various sources, including NOAA, Sea Turtle Conservancy, and the Department of Environmental Conservation, and Dr. Larry Wood of the Hawksbill Project.